Believe it or not, I’d never flown Alaska Airlines before. Blame it on Alaska’s historically limited network out of Dallas. With no connection to the Pacific Northwest, I simply didn’t have any opportunity to try them. However, thanks to my quest to try The Reggie, I needed to get to Alaska-stronghold Portland. With Alaska’s recently launched new service from Love Field, this seemed like the perfect opportunity to hop on board. Alaska’s service to Portland utilizes SkyWest E-175s, an airplane I also really wanted to try in long-haul coach. And so it was that I got to sample Alaska Airlines E-175 Main Cabin for the first time. As mentioned in the intro post, I paid $134 cash for the entire run from Dallas-Portland-Los Angeles. I checked in online the night before, and arrived at the airport about 90 minutes before departure via the DART light rail. (As an aside, taking mass transit to Love Field is a PITA. With no direct rail connection, it requires a shuttle bus to the nearest station. And hopefully the bus times the train well, as it only runs every 20 minutes.) I missed the morning rush, and enjoyed a practically empty Pre-Check line. I did manage a photo of our pretty new plane as we waited for boarding. The Eskimo tail is distinctive, I must say. Alaska configures its E-175s identically to Delta. That means 12 First Class, 12 Premium Class, and 52 Main Cabin seats. First features a 1-2 configuration, with Premium Class and Main Cabin in a 2-2 configuration. No middle seats in the back of the bus is a major win in my book. First impressions: the cabin seemed very fresh, with smart blue leather on all seats. Legroom also seemed exceptional for coach. Though the advertised seat pitch is 32″, it sure seemed more than that to me. Compare this to Southwest’s older 737, which measure in at 33″-34″ of pitch. I actually felt like I had more room in these E-175 seats. Perhaps I got lucky with this row, or maybe all seats are this roomy. Anyway, this made me glad I didn’t take Alaska up on their offer of a $64 upgrade to Premium Class. With legroom this generous, the value just isn’t there. On the other hand, seat comfort overall leaves something to be desired. Why? The seatbacks are HARD. As a rock. I felt uncomfortable after about 15 minutes. Exhibits A-Z of why I hate the new “slimline” seat designs. Another major negative? No in-seat power. For a 1-2 hour flight, it’s not big deal. But DAL-PDX clocks in at close to 4 hours. That’s a long time without juice. Indeed, my laptop battery crapped out with about 75 minutes to go. (I normally don’t work on board, but with tax deadlines looming, I needed to. WiFi and work-related software zapped my battery quickly.) Given that American (or even Alaska mainline) offers power on the same route out of DFW, this is a negative you should consider before picking an E-175 operated flight. 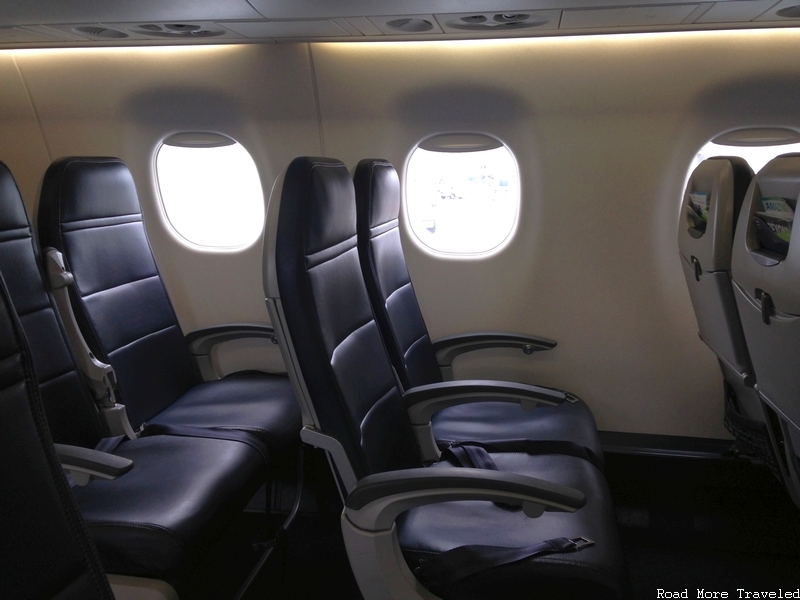 Overall – a clean, spacious cabin marred by uncomfortable seatbacks. Rather than provide seatback TVs, Alaska equips its E-175s with “BYOD” (bring your own device) entertainment. Alaska provides a variety of programming via the WiFi system, all free of charge. The selection definitely rates as extensive, with a wide variety of TV shows and movies. You won’t be bored in the Alaska Airlines E-175 Main Cabin. Note that what’s shown below represents only a small sample. I counted perhaps 50 movies and about a dozen TV channels. The system also includes a very basic (and mediocre) moving map. You can zoom in, but other than that, the map has no features to speak of. Better than nothing, but uninspired compared to similar offerings on competitors. Of course, with the entertainment system run via WiFi, that’s also available for purchase. The E-175 fleet comes equipped with Gogo WiFi. Interestingly, the system seemed much faster than usual. Perhaps that’s due to the smaller seating capacity of this aircraft (i.e. fewer people consuming bandwith). Regardless, I actually needed to work on this flight, so the usable WiFi was welcome. Unfortunately, the lack of in-seat power presents a problem. Running both the WiFi and my fancy pants tax software, my laptop battery crapped out over Utah, a good 75 minutes before landing. So I switched to my hour of free WiFi on my phone through T-mobile and watched cat videos on IG for the duration. Passengers may also purchase beer, wine, and liquor for an additional charge (or soft drinks for free). The selection includes Alaska’s famous PNW-sourced craft brews and liquors. Since I planned to eat heartily at Pine State Biscuits later, I passed on ordering any food. However, all Main Cabin passengers receive a complimentary Biscoff, served about half an hour after takeoff. As for service, color me impressed. For one, both Main Cabin flight attendants were warm and friendly. More than that, though, by the halfway point of our flight, they completed three water and one coffee run, in addition to the main drinks service. I challenge anyone to find that level of service on a legacy carrier. Any taxi through Love Field includes a good helping of Southwest planeporn. In this case, a very nice “Classic” 737 in the old livery. A north wind meant a takeoff to the south. But I expected to miss any views of downtown Dallas, given my seat on the starboard side. However, I was surprised and delighted by the skyline views as we hung a left after takeoff. …and later, of some badlands formations approaching the Colorado River near Grand Junction. Just as my battery conked out about 45 minutes later, we flew over the northern Wasatch Front of Utah. Then, as we began our descent, we enjoyed great views of a partially shrouded Mount St Helens off to the north. If you look very closely, you can also see Mount Rainier further in the background. Finally, our route through the Columbia Gorge gave us a view of the river as we reached Portland. Then, a distant shot of downtown Portland just prior to landing. One of the greatest things about flying a regional jet into PDX – remote gates where you walk to the terminal. That gave me a chance for an awesome closeup of our ride before heading inside. There’s no question that Alaska stands a cut above the competition when it comes to in-flight service. Friendly flight attendants are part of it, but little things make a difference, too. Such as coming through and offering water every 15 minutes – something I don’t see on the legacy carriers, or even Southwest. Alaska’s on-board menu also seems of better quality than the competition, at a reasonable price point. The plane itself features plenty of legroom in regular coach. But perhaps best of all, Alaska still rewards its flyers with mileage the old fashioned way. Mileage Plan awards 2,460 miles for my DAL-PDX-LAX routing, as a member without status. If I’d flown this itinerary with American, AAdvantage would award a paltry 670 miles ($134 times 5 miles per dollar). That’s a huge difference, even without taking into account the relative worthlessness of AAdvantage these days. On the other hand, no in-seat power for a 4-hour flight really stinks, especially since these planes are BYOD. If I were traveling for business, this might be a deal killer, depending on the alternatives. Uncomfortably hard seats are also a significant negative. A complicating factor is that, for now, Alaska offers mainline service to PDX out of DFW. I’d certainly prefer that, given the choice. As for competitors, I’d marginally prefer the AS E-175 to Southwest. Southwest doesn’t have power, either, the (d)Evolve seats aren’t exactly comfortable, and AS offers a more “premium” experience. Compared to the other legacies, though? I’d choose Alaska’s SkyWest planes in a heartbeat. Note: this post is part of my trip report series about my recent day trip to Portland. Click here for the trip report index and introductory post.